In February, Kuwaiti authorities discovered Demafelis' body in the freezer of an abandoned apartment belonging to a couple who had hired her. Even as she sought to leave the Philippines to find work abroad, Joanna Demafelis knew of the dangers that could befall her overseas. She had heard stories of Philippine workers subjected to abuse or even death by their foreign employers, her family would later tell the news site Rappler. Nevertheless, when a recruiter offered to set her up with a sponsor in Kuwait to become a domestic helper there, Demafelis was eager to accept it; she could make 10 times as much per month in the oil-rich Persian Gulf country than if she remained in the Philippines, the news site reported. And so, in May 2014, Demafelis left her home town and flew to the Middle East, becoming one of the hundreds of thousands of Filipinos to move there for work. She would not return home alive. In February, Kuwaiti authorities discovered Demafelis' body in the freezer of an abandoned apartment belonging to a couple who had hired her. According to local media, there was evidence that the woman had been tortured and strangled. Demafelis would have been 29 years old - though officials said she had probably been killed more than a year earlier. Demafelis' employers - Nader Essam Assaf and his wife, Mona Hassoun - reportedly fled Kuwait after the discovery of their maid's body, triggering an Interpol manhunt. They were later arrested in Syria. Assaf, a Lebanese national, was taken to Beirut, while Hassoun was held in Damascus, Al Jazeera reported. More than a month after his arrest, Assaf confessed to killing Demafelis and was charged with murder. On Sunday, a Kuwaiti court sentenced Assaf and Hassoun to death by hanging, according to the Associated Press. 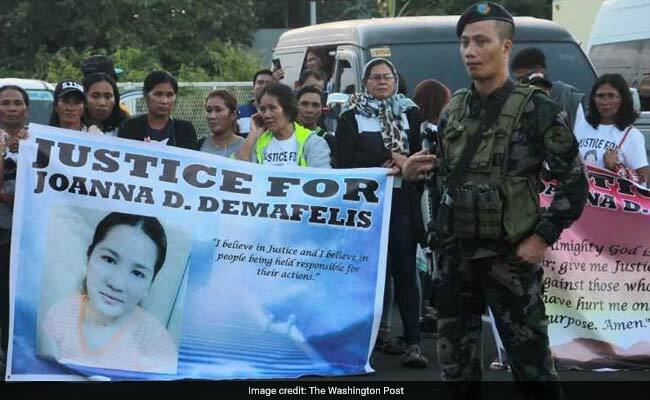 Demafelis's murder set off outrage in the Philippines, which sends more than 2 million citizens to work overseas. It also soured relations between the Philippines and Kuwait, as Philippine President Rodrigo Duterte banned Filipinos from working in the Persian Gulf country. At an early February news conference, Duterte, known for his outbursts and vulgarities, held up graphic photos of a Philippine worker's battered body and demanded answers from the Kuwaiti government. "Is this something wrong with your culture?" Duterte thundered. "Is there something wrong with your values?!" He also vowed to "sell my soul to the devil" so that Philippine workers could come home from Kuwait and "live comfortably." A week later, commercial airlines began flying more than 10,000 Philippine workers home from Kuwait for free, under an agreement with Duterte's government. The ban and subsequent departure of thousands of Philippine workers threatened to leave Kuwait with a "deficit" in domestic workers, which officials there said Tuesday they would attempt to fill by recruiting more Ethiopian nationals, Agence France-Presse reported. The recruiting spree comes just after Ethiopia lifted a five-year ban that had prevented Ethiopian citizens from working in Kuwait, after similar reports of abuse. For years, rights groups have raised concerns about conditions for the millions of foreigners - many from South Asia and the Philippines - working in Persian Gulf states in jobs such as construction and as domestic help. Among the hot-button issues is overcrowding and other problems at compounds housing male labor crews, and a lack of official oversight for women brought in as domestic workers. Claims of abuse against foreign women working as maids and housekeepers occasionally reach the courts in gulf nations, but rights groups believe the number of such cases is far higher in reality. Last April, a Kuwaiti woman filmed a video of her Ethiopian maid hanging from the outside of her window. The maid fell seven stories down - and survived; her employer, who did not help the maid, was arrested on a charge of failure to help, as The Washington Post reported. Also last year, a Jordanian woman living in the United Arab Emirates was found guilty of carrying out violent acts against her 28-year-old Indonesian housekeeper, including jamming scissors in her ears and dousing her with boiling water. "For any mistake, she would hit me with her hands, a knife, scissors, sticks and sometimes bite me, pull my hair and other times pour boiling water on my body," the Indonesian woman told the court. "I came to this country in good health and now I return home with a disability. I just want to go home." Under UAE legal rules, names of plaintiffs and defendants are usually not made public. Labor rules across the Persian Gulf region have come under greater scrutiny amid intense preparation ahead of Qatar's hosting of the 2022 World Cup. The venues for the event are being built by mainly expatriate workers from South Asia and elsewhere. Groups such as Human Rights Watch also have drawn attention to a widespread system known as "kafala," or sponsorship, under which employers hold workers' passports and prevent them from seeking new jobs with different employers. Some nations, including Saudi Arabia, have pledged to end that practice, but reforms have been slow. And they were too late for Demafelis, whose body was finally returned in February - in a wooden crate - to her grief-stricken family in the Philippines. Philippine Foreign Secretary Alan Peter Cayetano prayed with Demafelis' family members at an airport in Manila as they greeted the casket, weeping, the Associated Press reported. "Her death is very tragic but will also be a rallying point for all of the government agencies to be more aggressive abroad in helping our [overseas foreign workers] be protected," Cayetano told the AP.